This worksheet features some more advanced commonly confused words, like gambit and gamut. 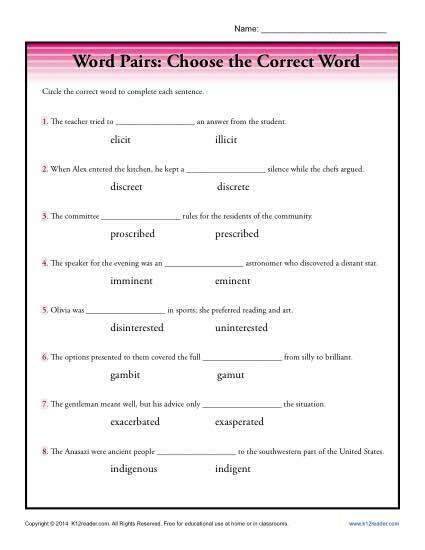 In it your student will select the correct word to complete the sentence. Students practice with the following word pairs: elicit/illicit, discreet/discrete, proscribed/prescribed, imminent/eminent, disinterested/uninterested, gambit/gamut, exacerbated/exasperated and indigenous/indigent. Use it to practice Common Core Standards for 9th, 10th, 11th, or 12th grade or for other students as appropriate.